There were signs this week that our democracy is fading. The unusual process undertaken by McConnell in attempting to pass AHCA without Senate input or public support. Alarming evidence that Russia may have tampered with 2016 Election Day results, and possibly with help from the Trump campaign. The Trump regime taking steps to shut down access for the media, while our country burns in bigotry and hate. Trump-Russia is still the dominant theme, as investigations open on new fronts, and Trump regime members go quiet and lawyer up. Trump continues to deny Russian interference, which will undoubtedly lead to it continuing in upcoming elections — of course to his benefit. For the first time since taking office, Trump visited Camp David. Russia renewed six unused Trump trademarks in 2016. Four of the six approvals were officially registered on November 8, Election Day. The Dept of Education said it will scale back civil rights investigations at public schools and universities, including rolling back Obama’s efforts to end campus sexual assault and protect transgender students. Six members of the Presidential Council on HIV/AIDS angrily resigned in a public letter saying Trump doesn’t care or have a strategy. Rick Perry, the Secretary of Energy, denied that man-made carbon dioxide emissions are the primary cause of global warming. Sessions’ DOJ is exploring new legal theories to take on sanctuary cities in court, and force them to aid in Trump’s deportation efforts. A Muslim teen was brutally beaten and killed while walking to a Mosque with her friends in Sterling, VA. A funeral vigil drew many, while the murder has yet to be charged as a hate crime. Trump Hotel DC will host a conference for anti-Islamic group, ACT for America, including a private tour. Neither the Trump organization or ACT would answer WAPO’s questions about the event and its cost. An attorney said his client was acting within his First Amendment rights when he disrupted a Black Lives Matter rally in Tennessee by wearing a gorilla mask and carrying a rope and bananas. NPR reported the Trump regime will not collect LGBTQ census data despite a HUD document obtained under the FOIA which cites this data as “essential.” Trump’s DOJ questions the “appropriateness” of sexual orientation and gender identity topics. Trump and his WH have made no mention or acknowledgment of June being LGBT Pride month. McConnell continued to secretly push AHCA in unusual ways. Not only is the closed-door bargaining not bipartisan, most Republicans haven’t seen the bill. NYT reported that Kushner’s team quietly reached out to high-powered criminal lawyers to represent him on the Russia probe. Sessions hired a lawyer to represent him in the Russia probe. Pence’s use of a private AOL email account to conduct government business is costing Indiana $100k in legal fees to process a large backlog of records requests. A lawsuit alleges private prison company GEO Correction donated to a Trump Super-PAC, in violation of federal law. Trump has adopted a pro-private prison policy. Mueller brought in Andrew Weissmann, a lawyer with expertise in witness-flipping. Speculation grew that Flynn is cooperating with the FBI, including by Sen Whitehouse, a ranking member of the Senate Judiciary Comm. Flynn failed to report a 2015 Middle East trip on his security clearance forms. The trip was to discuss a U.S.-Russian partnership, financed by Saudi Arabia, to build nuclear reactors throughout the Middle East. NYT reported that despite concerns about Flynn being a security risk, Pompeo continued to give him classified briefings for three weeks. NYT also reported that even though he gave Trump briefings almost daily, Pompeo did not raise the issue of Flynn’s ties to Russia. ABC reported Senate investigators are looking into financial ties between the Trump campaign and Russia/Eastern Europeans businessmen to see if dealing involved organized crime or those subject to US sanctions. Several names associated with financing for the Trump SoHo have alleged ties to money laundering or Russian organized crime. One name is Felix Sater, who was twice convicted and served jail time, and as per Week 15, worked with Michael Cohen on a back-channel plan for a Ukraine and Russia ‘peace plan’ (with new leadership in Ukraine). Felix Sater, a Russian-born former partner with New York property developer Bayrock, worked with Trump and his children on projects around the world. Bloomberg reported an employee of Bayrock, Jody Kriss, said he quit because the firm was a front for money laundering. A federal judge said a lawsuit by Kriss against Bayrock could proceed as a racketeering case. In a CBS poll, Trump’s approval hit a new low (36%). He is also losing Republican support: 83% approve on Day-100 vs. 72% now. Mueller brought in a second lawyer from the Solicitor General’s office. Elizabeth Prelogar is fluent in Russian and while at Harvard Law, won an Overseas Press Club scholarship to study Russian media and censorship. On Monday, Spicer did an off camera, no audio broadcast press briefing. The Trump regime’s access to the media has become increasingly erratic. While Spicer acknowledged he is helping find his replacement, Trump is considering new measures including limiting press briefings to once a week and asking reporters to submit written questions in advance. Also at the hearing, Jeanette Manfra, acting deputy undersecretary at DHS, said so far evidence exists that Russia targeted election-related systems in 21 states. Daily Beast reported that the DHS never ran a formal federal audit to see if votes were hacked. WAPO calculated that in Trump’s first 151 days, he has made 669 false and misleading claims. Boeing announced layoffs at the South Carolina plant Trump visited earlier this year where he promoted his “Buy America” pledge. Trump will hold his re-election campaign kick-off event on June 28 at the Trump Hotel DC. The cost is $35k per head, or $100k for host committee. While ignoring atrocities committed by numerous authoritarian leaders, Trump tweeted a falsehood, “Mexico was just ranked the second deadliest country in the world,” about our former close ally. Trump called new Saudi Crown Prince Mohammed bin Salman to congratulate him on his new role. Further to a BuzzFeed article in Week 31 citing multiple deaths in the UK at the hands of Russian operatives, The New Yorker reported on similarly mysterious deaths of Putin critics in the US. Tillerson proposed a three-point plan aimed at improving relations with Russia, including working together on cybersecurity. NYT reported that Trump’s WH is trying to get the House GOP to weaken the Senate bill that imposes sanctions on Russian. Rep Kevin Brady tried to block the Senate’s Russia sanction bill, saying it was “blue slip” violation — revenue bills must originate in the House. Democrats on the House Oversight Comm questioned why Kushner still has security clearance, and why Flynn kept his clearance, after public reports that both had undisclosed meetings with Kislyak. Rachel Maddow reported on a second bi-partisan letter to the Trump WH and acting FBI director McCabe questions Kushner’s security clearance. BuzzFeed reported that Bharara wrote a memo on March 9 to several senior DOJ officials outlining his concern about a third call from the WH. Bharara was fired on March 11. POLITICO reported that Trump has frequently lashed out at WH counsel McGahn for not doing more to quash the Trump-Russia probe early on. CNN reported that Coats and Rogers both told Mueller and the Senate Intel Comm in a private session that Trump suggested they say publicly there was no collusion between his regime and Russia. Coats told House investigators that Trump seemed obsessed with the Russia probe, and repeatedly asked him to publicly state there was no evidence of collusion. On Thursday in a cryptic tweet, Trump admitted he did not tape Comey, raising questions of whether his initial tweet was witness intimidation. Rachel Maddow reported on the many ways Russia, possibly with the help from the Trump regime, may have tampered with actual voting results on Election Day. WSJ reported Deep Root Analytics, a GOP data firm, left a proprietary data set with personal information on nearly 200 million voters unprotected online — where anyone could see it. Gizmodo reported the data leak contains detailed personal information on about 61% of the US population — including address, birthday, party registrations and views on issues for almost all registered voters. The RNC paid Deep Root $983k in 2016, but much of the data leaked came from The Data Trust, the GOP’s primary voter file provider. The RNC paid The Data Trust $6.7mm during the 2016 election cycle. The president of The Data Trust was Johnny DeStefano, who is now in head of personnel for Trump. Dallas County, a heavily Democratic area, said its web servers were targeted multiple times by Russian hackers. Of the 600 IP addresses provided by DHS as possible Russian hackers, 17 associated with Russian computers tried to gain access to Dallas servers. Rachel Maddow reported that adjoining counties that were heavily Republican did not have any matches from the 600 IP addresses. WSJ reported on VR Systems, a software company whose product were used to check-in voters in 21 of North Carolina’s 100 counties. VR Systems software failed in heavily Democratic Durham county. Durham county was forced to issue ballots by hand, meaning longer lines, and likely depressed voter turnout. Trump won NC, but the race was very close. TIME reported the Russian hacking of our election was more widespread than previously reported, and included at least one successful attempt to alter voter information and theft of personal info on thousands of voters. TIME also reported that there was one confirmed case of manipulation of voter data — raising the specter of falsified votes. CBS reported the House Intel Comm investigation on Russia has expanded to probe whether Trump associates received information from hacked voter databases. Parscale, digital director for the Trump campaign, emerged as a central figure in the Trump-Russia probe. Pascale, known as “Jared’s boy,” reported to Kushner. His firm was paid $91mm by the Trump campaign. The House Intel Comm will interview Parscale to ascertain if information stolen by Russian hackers made its way to the Trump campaign. As he takes over as House Oversight Comm chair, unlike his predecessor Chaffetz, Gowdy said the committee will no longer probe Trump-Russia ties or violations of the emoluments clause. A NBC/WSJ poll found that by a 2–1 margin, Americans believe Comey over Trump. Just 27% approve of Trump firing of Comey. Friday, Trump told Fox & Friends he tweeted his lie about the existence of tapes in order to influence Comey’s account of their conversation — further raising the specter of witness intimidation. Also in the Fox & Friends interview, Trump left open the option of firing Mueller because of his “bothersome” friendship with Comey. A WAPO bombshell reported on a CIA report delivered only to Obama and three top officials in August, revealing Putin’s specific instructions to defeat or at least damage Hillary, and help elect Trump. WAPO also reported in the months ahead of the election, the FBI became alarmed by an unusual spike in temporary visa requests by Russia for officials with technical skills to enter the US. Permission was denied. The Obama administration’s response was mild and fairly muted, in part, according to WAPO reporting, concern that Russia would sabotage our Election Day. WAPO also reported on GOP efforts to block intelligence from informing the public, and from acting including the SoS of Georgia who called Johnson’s proposal to shore up voting as an assault on state rights. NBC reported Trump has taken little meaningful action, and shown no interest in stopping Russia from hacking our next election, despite a slew of intelligence warnings that Russia will be back. Trump has yet to pass a single piece of major legislation despite control of the House and Senate. He seems largely disinterested and disengaged in this sphere. 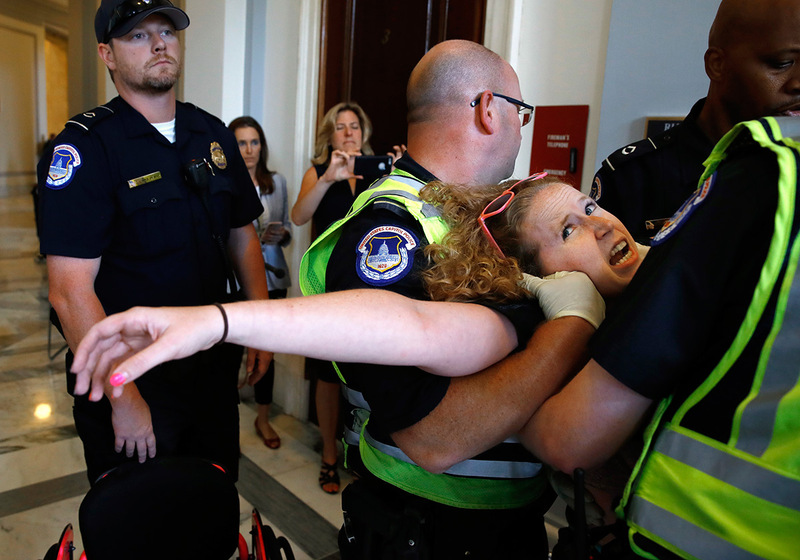 Stephanie Woodward, of Rochester, NY, who has spina bifida and uses a wheelchair, is removed from a sit-in at Senate Majority Leader Mitch McConnell’s office as she and other disability rights advocates protest proposed funding caps to Medicaid.